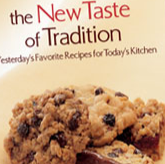 Head on over here to request a FREE Sun-Maid ‘The New Taste of Tradition’ Recipe Booklet! You should be able to request both booklets! You can choose to either download this booklet, or have it sent to you by mail!